VE2IQ ON Bill says Thanks again for a very interesting test. Static level here in Ontario tonight was terrible. WB0LXZ KS Bill says - during the “two tone test” I could see the two tones and three “ghosts” on the ARGO screen caused by harmonic distortion. They were all evenly spaced. I measured the spread as 22.96 and divided by 4 to get 5.74 Hz as the difference frequency. Fun. W3JW VA Signal strength conditions were weaker than "normal" and QRN was less than the 11 JUL test. Doppler effects (as observed on SL waterfall display) were significant but not as severe as recent tests. Most results were obtained with SpecLab. KM1P MA Results will be interesting. I need to come up with a new technique ... my measurement resolution is fairly coarse at 0.17Hz (65536 point FFT on data sampled at 11025Hz). K6OQK CA Burt says Your signal was weaker than usual at my location. Doppler spread appeared to be about 1 Hz wide but I may be learning how to look deep into the waterfall display and find the right signal if it will hold still long enough. This was a very interesting FMT and the format works well. Many thanks to you and Pam. W1PW AZ Phil says - I didn't come up with a way for my xcvr/ears mode to establish a correction factor for the two heterodyned signals. W6OQI CA I hope I understand how you want the results of uncorrected vs. corrected reported. K6APW CA Jim says - very interesting to listen to the two carrier shifting of the beat! Too tough to count in the QRN though. The sharp dips of W6OQI from S9 to S5 or so - also interesting -- double beats sometimes. Thanks for the continuing education. K6YAZ CA Stuart says - not too strong but OK in 20 Hz bandwidth. Doppler fairly low. Marvin quite strong as expected but with some QSB and slight Doppler shift. Well thought out test tonight both for Spectra Lab users and mere mortals such as myself. Thanks for the test. K8JQ WV Seemed to be more Doppler on 80 meters than in recent tests. VE2AZX QC Conditions were average on 80m Sig was 55. The standard deviation of my readings was .55Hz. 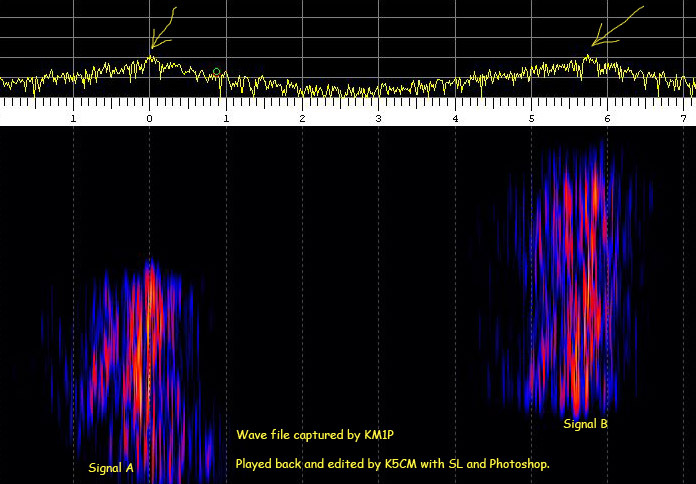 This is a screen capture of a wave file generated by Joe, KM1P in Boston. In this example it is not important to know any details form Joe as to what frequency his receiver was on. By definition it is know that Signal A is on 3556100. I looked for and found a spot when both signals A and B looked the same (top trace). I measured the difference between the two points, which even at this relatively low resolution can be measured to be about 5.75Hz. Add the 3556100 to 5.75 to get the frequency of signal B 3556105.75 Hz, off from the true frequency by 13mHz. Even at this small amount of separation it would seem that the signals are at least fading at a different rate, however more testing is needed to verify this. It was interesting watching my plate current on the Drake almost drop to zero as the two frequencies beat together. VE2IQ almost hit the nail on the head with a corrected reading of ".001 Hz low". W3JW and WB0LXZ both turned in ".003 Hz high" readings. It will be interesting to see if they can repeat. A HP-Z3801 GPS clocks a HP-3336B and a PTS-250. A small 10 db transistor amp follows and drives a 12BY7 / pair 6146. Then to a Drake L4B at 300 watts output except on 30 meters where the power is 75 watts.